We’ve been away on a camping trip for a week, but starting back up with a bang….BEETS! Wacked-out color, floppy texture, weird vegetable discs out of a can. Ick. That about sums up what I knew about beets as a kid. Later I got into the occasional fresh carrot, beet and apple frappés at farmer’s markets in Puerto Rico, but that was more a Saturday morning hangover-helper type thing as I was shopping for vegetables than a real affection for beets themselves. It wasn’t until many years later that I had a food revelation at Blue Hill restaurant in Greenwich Village. I was doing a story on Chef Dan Barber for Le Connoisseur, a Puerto Rico food and wine magazine. He is a locavore chef in the tradition of Alice Waters and even owns his own farm. His other Blue Hill is located at Stone Barns, the Rockefeller organic farm center right by Sleepy Hollow, north of New York City http://www.bluehillnyc.com/. So the chef trotted out a number of tiny dishes, including a single square of beet on a skewer. It looked like a precious jewel and the flavor was giant: intense, concentrated, sweet. I was hooked in a single morsel. However, it wasn’t until getting involved in CSA (Community Supported Agriculture) that I actually had to figure out how to prepare them myself. Like, do you actually cook them? How? Do you peel them first? What about the greens? Here are some short answers, followed by a showstopping roasted beet recipe. I have toyed around with this next recipe for several years now, and I think I have finally hit just the right balance of sweet and sharp. It also takes advantage of the beet greens. It is a gorgeous looking salad and the taste is, well, revelatory. El amor entra por los ojos -- This dish is love at first sight! Preheat oven to 400°F. Trim greens from beets. Cut off and discard stems. Coarsely chop leaves and reserve. Wrap each beet loosely in foil. Place on oven rack and roast until tender when pierced with a fork, about 1 hour 20 minutes. Cool, then peel beets (use gloves or small sandwich bags to protect fingers from stains. Cut into eight wedges and place in medium bowl. Bowl four cups of water, then add beet greens and cook until tender, just 2-3 minutes. Drain, cool and squeeze out as much water as possible. 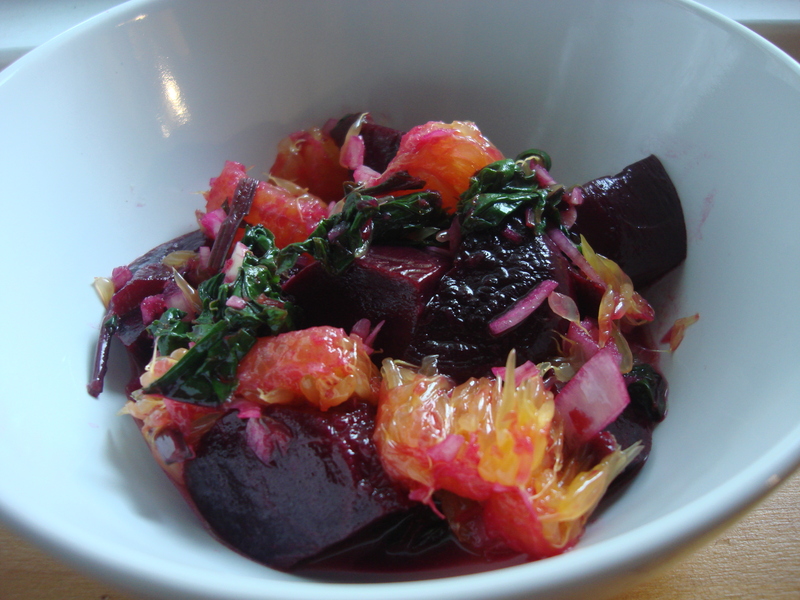 Add greens to beet bowl. Add orange segments (you may break them up) and shallots to bowl. Whisk vinegar, oil, garlic and orange peel in a small bowl to blend well and add to beet mixture. Stir to coat, season with salt and vinegar and allow to stand for at least an hour at room temperature before serving. *You may notice that beets add color to your subsequent bathroom visits. Do not be alarmed! And kids find it very amusing.